Huemor Designs offers a variety of website design services for clients to choose from. When creating a design, they aim to combine experience and content into a final product that's elegant, stylish and sophisticated. They believe that this is the answer to immediately grabbing the attention of visitors. 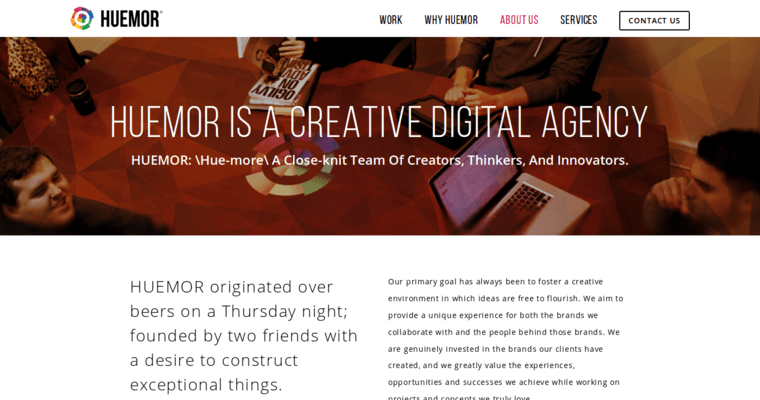 The designs built by Huemor Designs are custom made, even down to the smallest of interface choices. By doing this, the client will receive a website that is unique when compared to websites in the same industry. Their strong attention to detail manifests itself in consistent branding, an easy-to-use interface and quick navigation to any page on the website. Above all, they want the website design to be memorable. For a better user experience for visitors on mobile devices, Huemor Designs implements a responsive feature into every website they create, which automatically scales screen resolution depending on the device it's accessed from.